I’ve got plenty to tell about my experiences of our two month trip to Silicon Valley, but I’ll start with telling about the conferences and events I’ve attended. I’ll start the story with the most important and the biggest one, Linux Foundation’s Collaboration Summit which was held in April in San Francisco, at the Hotel Kabuki. 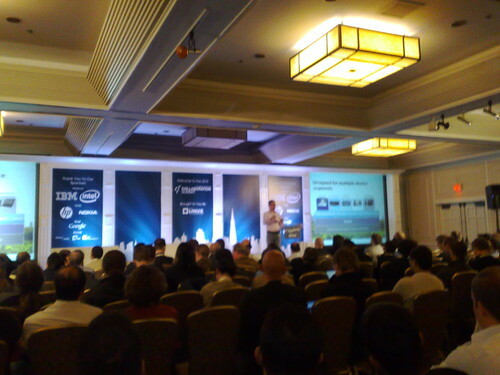 The Linux Foundation Collaboration Summit was held in San Francisco on the 14th to 16th of April, 2010. 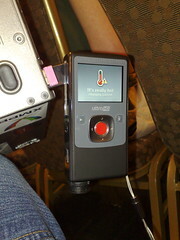 Because of the flu I attended only the two first days, but that was plenty of action! Our hotel is down south at Sunnyvale so I had to find a way to travel to downtown San Francisco. I don’t have a car or drivers licence, so Caltrain was the only viable option, and that was plenty of adventure! I did plan to use the public transport in San Francisco, but it was too much for my hazy brain and I ended up using the taxi from the train station to Hotel Kabuki, where the conference was held. 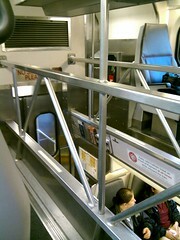 Being afraid of heights traveling on Caltrain was an experience, as the carriages were double-decker (see picture). We visited Japantown on the Sunday previous to the conference so I’d know a bit about my surroundings, and it was a good decision. The hotel the conference was held is very pretty, and it’s next to a shopping centre full of Japanese shops and restaurants. It helped a lot with my navigation later! Arriving to the venue on Wednesday we got breakfast and while eating my croissant and drinking my coffee, Elizabeth introduced me to couple of people, including Landon Jurgens from GE. I also had a little touch with fame as Bradley M. Kuhn joined our group and we talked, among other things, about Star Wars memorabilia. Geek, me? I think one of the biggest reasons Linux is becoming more and more successful is the omnipresence of electrical and information technology related equipment. Even if personal computers might be running Windows or OS X or other non-Linux operating systems, there’s plenty of appliances, mobile phones, networking hardware, cars and DVR’s around. After lunch Ari walked on the podium wearing a Maemo shirt to give his keynote about MeeGo, the free and standard Linux for the mobile industry. As we know, MeeGo is the result of the recent co-operation incentive of Nokia’s Maemo and Intel’s Moblin. There’s great hopes for this one, but I have been more or less out of touch of the real ideas behind MeeGo since I happened to be very, very sick on the week the new project was announced. Having been watching the Maemo development from close range for quite some many years, the fact that MeeGo is aimed at not only smartphones but also TVs, tablets, car systems (and trains, planes etc) and netbooks requires some mental adjustment. MeeGo will be using Qt, Telepathy, WebKit, Fennec, RPM and GNOME, so there are some changes to Maemo. I’ve looked at the community response and the change to RPM has been the hardest to digest so far by the people. What Imad stressed in his talk is that MeeGo plans to work very closely to the upstream. If you want a kernel patch into MeeGo, send it to kernel upstream instead of MeeGo. If you want a Qt patch into MeeGo, send it to Qt. The presentation about how to prevent communities and co-operation was hilarious. Josh Berkus engaged the audience with his Over The Wall presentation. He had condensed how to stop global warming in a few easy steps that make sure you’ve built a wall between your developers and the community and stop contributions. The first premise you need to apply to the rest is that your developers do not take part in the community and all the releases are done in code drops, as thrown over the wall. The first day of the event was brilliant, and we moved to a Japanese restaurant to an afterparty. I was getting tired after waking up at five o’clock and left the party around eight o’clock, to recuperate from the day to be ready for the next day. That’s up in my next blog post, coming up soon on this same bat channel! If you want to read a more accurate description of both the first and second day of Linux Collaboration Summit 2010, I highly recommend reading this Qaiku thread, written by Henri Bergius. 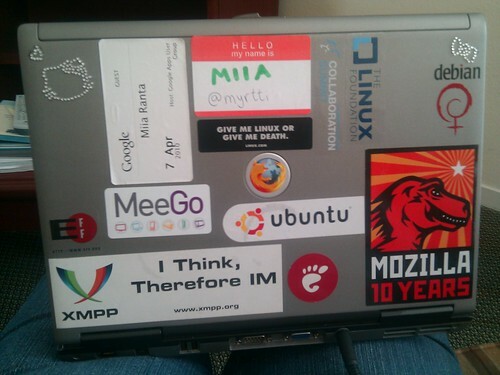 This entry was posted in general, ICT, Job, Life, Planet Ubuntu and tagged collaboration, community, conference, event, Google, IBM, Intel, linux, MeeGo, Nokia, Nomovok, PostgreSQL. Bookmark the permalink.